You don’t need the holidays or even a special occasion to celebrate life with good Champagne. But we know this time of year folks are looking for a quality bottle of bubbly. So we thought we would share one of our favorite non-vintage Champagne selections. While most non-vintage Champagne is made up of several individual vintages blended with uniformity in mind, the aim of Jacquesson’s 7-Series is to emphasize the best qualities of a given year. The Cuvee No. 735 is comprised of 72% 2007 first-press juice. And though non-vintage Champagne producers are only required to age their products for fifteen months, by the time Cuvee No. 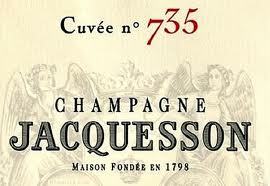 735 was released in March 2012 it had a full four years of bottle age, including two-years after disgorgement. It is fairly priced Champagne that can also show the particular character of a year. It is the vintage non-vintage. Although technically a Champagne “House”, brothers Laurent and Jean-Herve Chiquet operate Jacquesson much like a “Grower” operation. Besides their own organic and sustainably farmed 77 acres of vineyard (severely pruned for low yields), they work closely with their neighbors to supplement from an additional 27 acres, all in Grand Cru and Premier Cru areas. This attention to fine detail shows in a glass. A fleshy blend of 47% Chardonnay, 33% Pinot Noir and 20% Meunier embraces each and every one of your senses. From the satisfying pop of the cork to the last, creamy swallow, you journey across orchards of pear blossoms, rocky outcrops, and a bakery full of warm brioche. Sure, you might save a few bucks with the NV Champagne that you see on all of the grocery store end caps this time of year but you’re not going to get anywhere near the freshness, vitality or pure drinkability of Jacquesson NV Brut Cuvee No. 735. Robert Parker’s Wine Advocate (92 pts) calls it a “deep, satisfying Champagne”. We couldn’t agree more. Elie Wine Co. wishes you a warm holiday filled with friends, family, and fine wine.